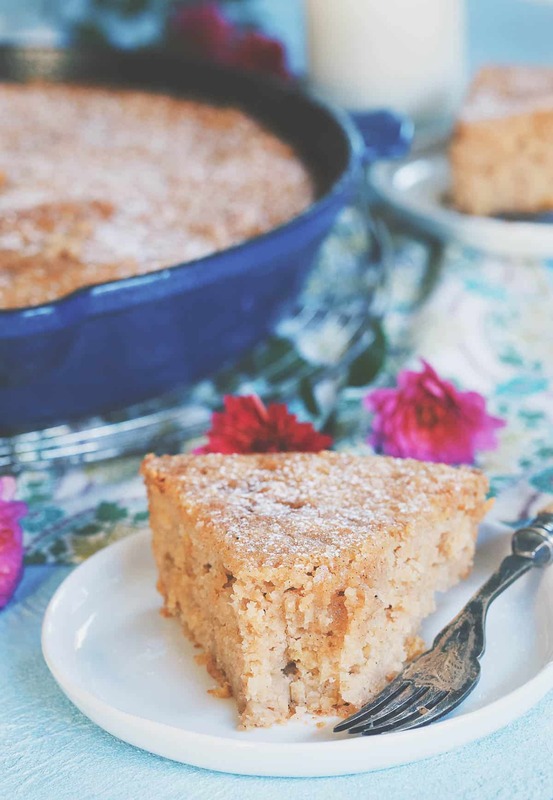 If you’re looking for a simple fall dessert that can even pass as a snack, this applesauce raisin skillet cake recipe is for you. It’s quintessential fall deliciousness! I visited my parents, brother, sister-in-law and the munchkin niece and nephew this past weekend in New Jersey. We went apple picking on what was basically the most perfect fall morning and my adorable 2.5 year old niece (who redeemed herself from the previous night’s dinner fiasco –> omg, THAT is why I don’t have kids) loudly claimed “but, I want to pick THIS one!” with each apple she plucked from the lowest hanging branch. The entire 1.5 hour event was evidence that adorableness and exhaustion can exist simultaneously. When we got back to my parents’ house, my mom (who had picked half a bucket full of Cortlands for this very purpose) immediately began making applesauce, my favorite thing to make with freshly picked apples. See this guide to apples for ideas on how to use each type of apple! Some people are all about the crisp, the pie or, the cobbler even but to me, there’s nothing better than homemade applesauce. I eat it plain, swirled in yogurt, on toasted bread, even with ice cream. Weird? Maybe. Delicious? Very. I didn’t go home with any of her applesauce (I have plans to make my own after some apple picking this week) but as I paged through Megan’s new cookbook, Cast Iron Gourmet for like the 10th time trying to decide what to share with you guys this applesauce raisin skillet cake jumped out as the perfect recipe given the time of year. I love a simple cake. You know the ones, they’re nothing fancy in the looks department (like this apricot brandy cake I swear by during the holidays or this almond apple cake I make every year right around this time) but they literally blow you away with the first bite, their flavor so delicious you almost can’t even convey the taste through words. That’s exactly how I felt when trying to describe this glazed orange cardamom cake last winter to you guys. Gah – now I’m excited to make that recipe again this year! This applesauce raisin skillet cake is one of those recipes – its simple ingredient list in complete juxtaposition to the deliciousness of the flavors baked together in the finished product. Megan’s entire book is filled with recipes like this. In fact, I don’t think I’ve ever bookmarked so many recipes to make in any cookbook, ever. I made the Kalua pig from it earlier this week and I’ve never seen 2 people eat 5 pounds of pork so fast before. It was slightly disturbing actually and completely baffling how 5 or so ingredients in a pot for 6 hours could transform into what it did. It was a sad thing to see the bottom of that Tupperware container. Cast Iron Gourmet is a cookbook dedicated entirely to your cast iron cookware. 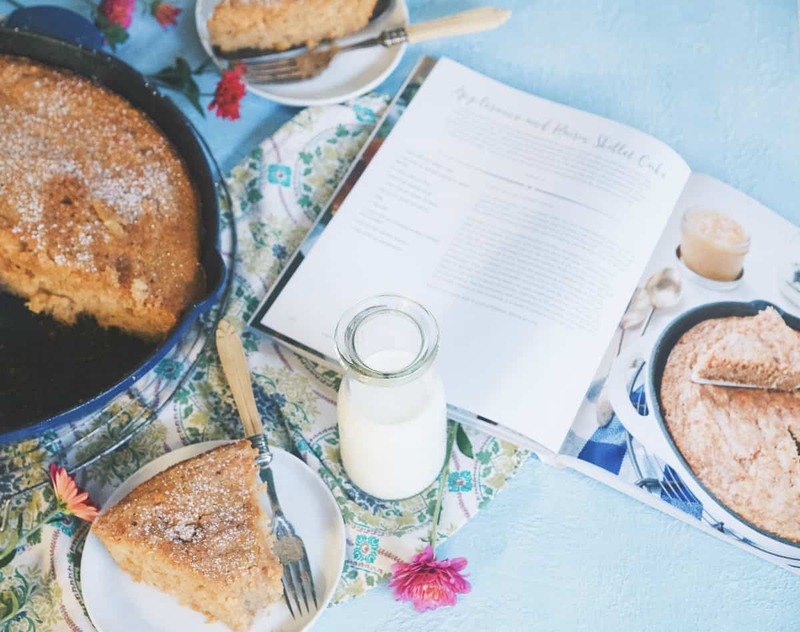 Whether it’s a traditional cast iron skillet or a Dutch oven, there are recipes from simple dinners to long slow cooked meals great for weekends, amazing desserts like this applesauce raisin skillet cake and even an entire chapter for recipes with 5 ingredients or less. Megan also has quite a bit of information in the book on how to care for your cast iron cookware correctly to keep it in the best shape for years to come. It’s always fun to find a cookbook you truly love, it’s even better when that cookbook is written by someone you’ve been lucky enough to call a good friend in this weird world of blogging for the past 5 years. Megan is one of my OGs when it comes to blogging friends (throwback to our old PW Wednesday posts with her, Julie, Rachel and Tina! ), we met and roomed together in Orlando in 2013 at the Food Blog Forum conference and got to see each other again last summer in Utah when this book was just in its infant stages! I’m so excited for her with the release of this book and a new baby all in the span of a month! And even more excited to continue cooking my way through Cast Iron Gourmet recipe by recipe. 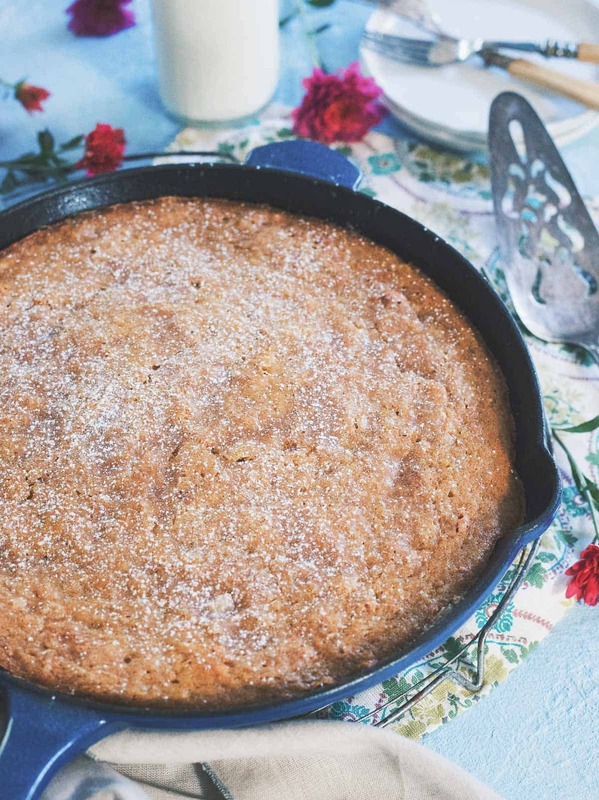 Love this Applesauce Raisin Skillet Cake recipe? Try Ricotta Almond Fig Cake, Basil Nectarine Upside Down Cake, and Cinnamon Cake Bars. 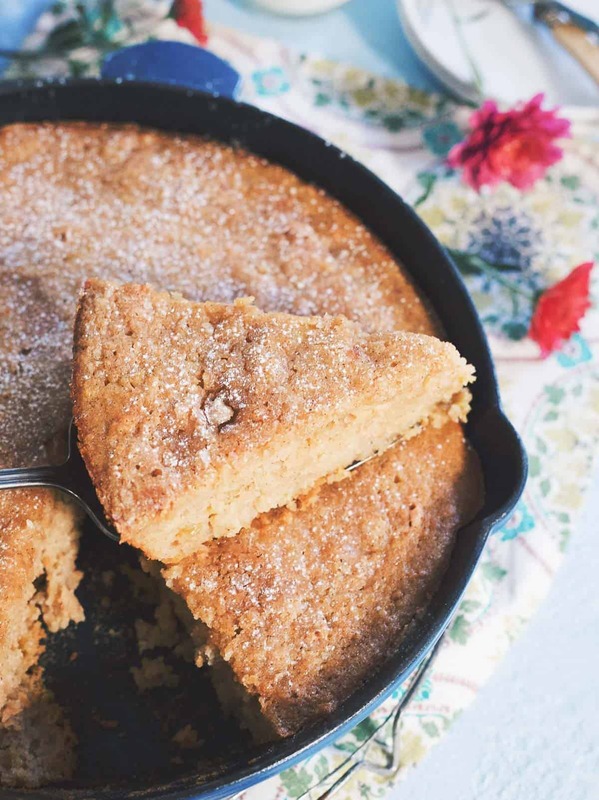 If you're looking for a simple fall dessert that can even pass as a snack, this applesauce raisin skillet cake recipe is for you. It's quintessential fall deliciousness! If not using a well-seasoned cast iron skillet, line the skillet bottom with a round of parchment (mine is pretty well seasoned but I lightly greased with some butter). Combine apple cider and raisins in a small sauce pot. Bring to a simmer for about 5 minutes and let the fruit absorb some of the cider. Turn the heat off, remove from heat and let cool. While that cools, whisk together the flour and baking soda in a small bowl. Set aside. Whisk together the sugar and apple pie spice in a large bowl. Remove 2 tablespoons of the sugar mixture and set aside for later. Add the egg, salt, butter and vanilla to the large mixing bowl with the sugar mixture and whisk until light and fluffy, about 30 seconds. Transfer the raisin and cider mixture to a food processor. Process until almost smooth then pour into the mixing bowl with the sugar mixture. Add the applesauce to the same mixing bowl and mix together until combined. Fold the flour mixture into the large mixing bowl until just combined. Transfer the batter to the prepared skillet and smooth the top with a spatula. Sprinkle the reserved sugar mixture on top of the batter then place in the oven to bake for 30-35 minutes. *Many dried fruits would work here. Dark raisins, dried cranberries, dried cherries, etc. to change it up based on seasonality/what you have on hand. **I don't keep apple pie spice on hand because you can easily make it on your own by combining cinnamon/nutmeg/cardamom/allspice. I eyeballed it and added all of those to this recipe. ***I used unsweetened natural applesauce. Homemade would be great too. There's really no need for applesauce with additional sugar in this recipe (or in life! ).